Former First Vehicle Leasing employee Julia MacFarlane is raising funds for the British Lung Foundation in the Virgin London Marathon on the 13th of April 2014. Please support her fundraising efforts with a donation by mobile phone (by texting JMAC84 £5 or JMAC84 £10 to 70070), online or offline. Julia’s Justgiving page is at http://www.justgiving.com/Julia-MacFarlane3 where her target is to raise £1900. At present, she’s around half way to meeting her target – please help her to smash the target with a donation. 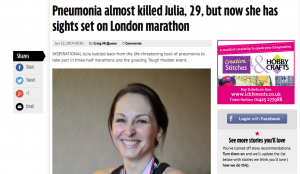 Julia’s story was featured earlier in the year in the Daily Record after she won a battle from a life-threatening bout of pneumonia. This entry was posted in News and Views and tagged British Lung Foundation, charity, FVL, JustGiving by David Petherick. Bookmark the permalink.